At long last we have sight of the report by by Sue Charteris into the Labour plan to close our libraries. Click HERE for a copy of the report. Having now read it, it is no surprise that Steve Foulkes and his cronies made such a humiliating U Turn on the closure programme. The report basically damns their actions! Among the key findings, is this: The Public Inquiry into Wirral Metropolitan Borough Council’s (MBC) Library Service has found the Council’s decision to restructure its Library Service to be in breach of its statutory duties under the Public Libraries and Museums Act 1964 , to provide “comprehensive and efficient public Library Services for all persons desirous to make use thereof”. TIME FOR CHANGE! Even with todays figures to be added, I am delighted to be able to say that the month of November has been the best for visits to this site, already exceeding 5,000 hits, and smashing the previous best month by over 500 visits. It seems the mix of what we are doing here, locally, for the community, mixed with the political side, locally and nationally is a real winner. Thanks to everyone for visiting, please bookmark the site and come back again. I understand that at around lunchtime today the DCMS will be releasing its report into Wirral’s Library fiasco. It is just a couple of days over 12 months ago when Wirral’s ruling Labour/LibDem coalition agreed to consult on the Stategic Asset Review (SAR) which included the closure of many of our Library’s, Leisure Centres and Swimming Pools. Only one day before the first of Wirral’s Library’s was to close, Andy Burnham, the then Minister for the DCMS halted the closures and ordered a public Inquiry into the Library closures. That Inquiry was chaired by Sue Charteris and was held over two days at the Floral Pavillion. Readers will recall that having had sight of the contents of the draft report from Sue Charteris, the ruling Cabinet, in a clandestine midnight meeting with Council Officers carried out the biggest humiliating U Turn Wirral has ever seen and scrapped the closure programme. Today we will all get to see the contents of the DCMS and Sue Charteris reports. Should make for interesting reading! Having just read the rantings ramblings of Seacombe New Labour Councillor Adrian Jones, I am delighted that he is happy that the Moreton West and Saughall Massie Conservatives are, ‘stagnating’ on a 70.09% share of the vote at last weeks by-election, and is overjoyed at his party’s 19.1% share! Thats OK then Adrian, if it makes you happy who are we to disagree? Oh, by the way does Angela share your view? Earlier today, in my Merseytravel role, I attended the Merseyside Transport Trust’s celebration of the 40th Anniversary of the passenger Transport Executive/Authority (MPTE/MPTA) at St Georges Plateau in Liverpool. 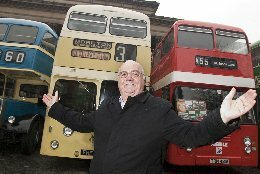 Around 16 heritage buses were on display from around the area, including many of the old ‘Corpy Buses’. The event, runs from 11am to 3pm and includes the operation of several special services on a short route around the city. The event and special bus rides are free. So if you have an hour or so to spare it is worth a look. I have been contacted by various businesses on Hoylake Road who have raised concerns about a proposed ‘Drop in Centre’ being opened by the ‘Social Partnership’ (TSP) for recovering drug addicts, and people with alcohol problems. Even though the premises are now ready to open, they have only recently submitted a planning application for the change of use. Planning application number, 20096272, at 288 Hoylake Road, Moreton, Wirral, CH46 6AF. One of the businesses very close by is Funtimes. Funtimes is a play area for children up to the age of 7, and the owners already tell me that some parents have already expressed concerns. Now please don’t misunderstand me, I fully suport all initiatives to help those people in need of help and advice to put their lives back in order, in fact I have long advocated that more money should be spent on alcohol problems, something that is well known by Wirral DAAT and the Crime and Disorder Reduction Partnership in Wirral, however the location of these particular premises does seem a little innappropriate. I have set up a meeting with TSP and the DAAT, hopefully that will sort some of the issues. In the meantime at the request of local businesses I have taken the planning application out of delegated authority which means the planning committee make the final decision not Council officers. The owners of this site accept no responsibility for the content displayed on any external sites accessed from links via www.chrisblakeley.com, or for the content of any and all comments posted by viewers of this site No articles or images from this site may be reproduced without written consent.